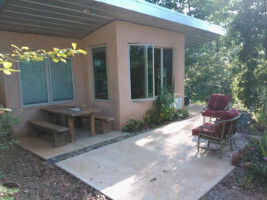 This little home became our means of surviving the Great Recession. By making it small and simple, we were able to finish it with very little money. By making it very efficient we were able to keep our home comfortable with total energy costs of only $600 a year. By using quality materials, we were able to reduce maintenance to almost nothing. We believe these ideas could help others to live better and spend less. 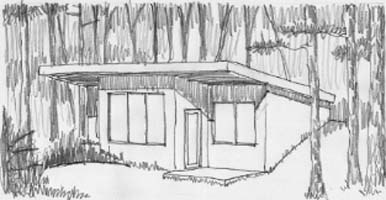 We have been talking to several people about modifying this tiny cabin plan for their needs. There was no budget for complicated and expensive systems. This cabin saves energy in ways that do not cost much or take up any space. The best solution is always a combination of ideas. First we increased winter sunshine, while shading summer sunshine. We faced the glass south and protected it with just the right amount of roof overhang. This was easily done by sizing the roof overhang for the different sun angles in each season. No sun touches any glass between May 1 and August 12. 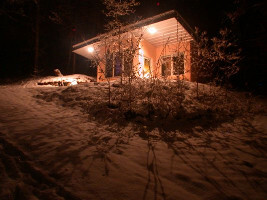 In December and January the winter sun floods the cabin with warmth and light. Soil against the walls on the north, west, and east sides will keep the home warm in the winter and cool in the summer. Higher quality insulation and air tight construction help too. A packaged terminal heat pump provides very efficient heating and cooling for very low cost. This cabin is also designed to exhaust the heat in the summer, making it very rare that we need to run the heating or cooling. The wood was finished with pure, hand rubbed tung oil. The walls were covered with the same lime plaster used centuries ago in Italy. This material is too alkaline to support mold. We chose acid stained concrete floors for the same reasons. Plus these materials are durable, easy to clean, and beautiful. And they don't off gas the chemicals found in many manufactured materials. Something we did not anticipate is that a tiny home with closed cell foam insulation on the walls gets very humid when closed up. With just one shower the air can go from 55% to 95% humidity. A bathroom exhaust fan does not work well in a sealed up house, unless a window is open. Whenever the windows are closed and we are showering or cooking, a dehumidifier needs to be running. But that is okay because the tiny bit of heat from a small dehumidifier is enough to keep this cabin warm most winter days. What about when the weather is bad? 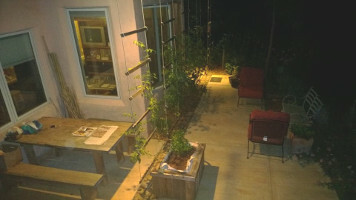 We planned a garden patio for planting herbs, vegetables, and flowers. It adds living space with an outdoor kitchen, living, and dining area. A wood fired grill and masonry pizza oven is planned alongside an outdoor sink for cleaning garden vegetables or fresh fish. This patio is pleasant even on cold days. The cabin blocks the cold north wind, allowing the sun to warm up the patio. At night recessed lighting in the roof overhang lights up the whole patio without glare. This all encourages more time outside. The table is positioned under the roof overhang and can seat as many as eight. What about cooking inside? Can a complete kitchen fit in a 460 square foot cabin? Yes, with careful planning. 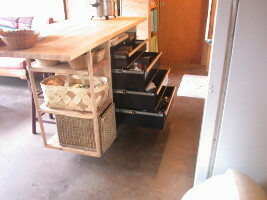 Key is an island on wheels made from a rolling mechanic tool cabinet with a butcher block countertop. Lots of storage inside, plenty of work surface on top, which can be cleared away for a dining spot for five. A single portable induction burner serves as a mini cooktop. When cooking is done it can be cleaned and put in a drawer. A small convection- microwave oven provides two functions in a smaller space. 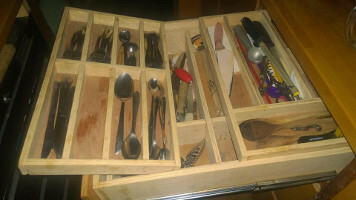 Drawers have storage systems to keep all the tools needed for quality home cooking. It is easier to cook in this tiny kitchen because everything is within two steps. We had to compromise a little on accessibility because of the tiny size of this cabin. But we still planned for just a single 1 inch step at the entry door. And everything is on one level. Our friends thought we had lost our mind when they heard our cabin had only 460 square feet, until they saw it for themselves. Most people judge a house by its size. But with careful planning a lot can be fit in a small space. One way to do this is by using hidden spaces for storage, and designing the storage for what we have. Careful planning for multiple uses can also save a lot of space. The kitchen island provides space for storage, food preparation, and eating. But it can also be wheeled away to expand the living room. Hanging the TV on a bracket frees up the space behind for the audio and video components. We can access the record player by swinging the TV out like a cabinet door. We also saved a lot of space by reducing the size of the bedrooms. Why have living space in the bedrooms and the living room? The huge windows in each bedroom make these tiny spaces feel open. We have lived in this cabin since 2010. It wasn't our plan to stay here this long. We hoped to live frugally here so we could finish the Mountain Model Home quickly. We didn't plan for the Great Recession. Living tiny has its negatives: Bring in just a few more things and the cabin gets real cluttered. For every item in, one has to go out. Also, it gets dirty more quickly. Noise travels throughout. And some of our friends are not comfortable spending time in our tiny space. But there were many plusses: Less things equal greater freedom. Less to clean and repair. More time. We don't lose things as often. There is only one place for each item. Things are easy to put away just a few steps away. I appreciate how living small helped us survive a horrible economic crisis. It also enouraged a closer family. While we are looking forward to finishing the larger Mountain Model Home down the hill, we are less excited about that project because this cabin is nice. Would you like to see the Mountain Model Cabin? Contact me for an appointment. Or perhaps you would enjoy seeing how it was built in our Construction Diary (This takes you to our old web site until we finish this new one).